I seem to be on a biscotti jag lately. I love the crisp crunchy dry texture that begs for a good cup of steaming hot coffee or cappuccino. I love their rustic nature and the fact that most recipes have a lower sugar content and very little to no butter. And secured in an airtight container, they will last for quite a long time. Biscotti also make great gifts on any occasion. This recipe comes from David Lebovitz, a pastry chef who’s earned everyone’s good trust with several terrific cookbooks over the years. These biscotti have a delicious depth of flavor from the use of good quality cocoa powder. That flavor is deepened with the addition of chocolate chips or chopped chocolate. The texture is also beautifully enhanced with chocolate’s soul mate, toasted almonds. Although I didn’t take the extra step, David says he sometimes smears one side of the baked biscotti with melted dark chocolate. That, of course, would take these cookies into the realm of chocolate nirvana. - Since there’s a lot of cocoa powder in this recipe, use a good quality one, either natural or Dutch process. - The dough may seem like it won’t hold together. Just gently press it into shape and it bakes off beautifully. I form the logs directly on the prepared baking sheet rather than trying to pick them up and transfer them from another surface. 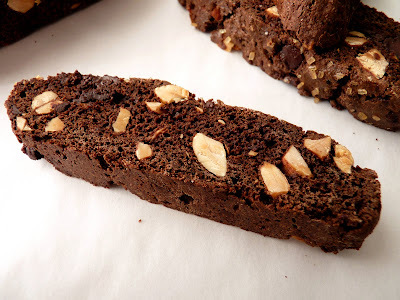 - Use a sawing motion with a good serrated knife to slice the biscotti after the first baking. This will help prevent breakage. 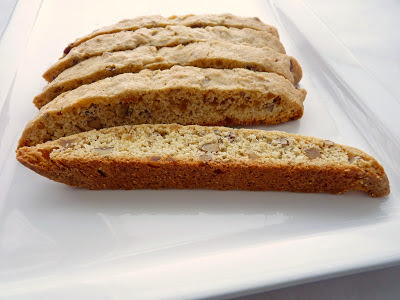 - If you want your biscotti extra-crisp, turn each one over half-way through the second baking. 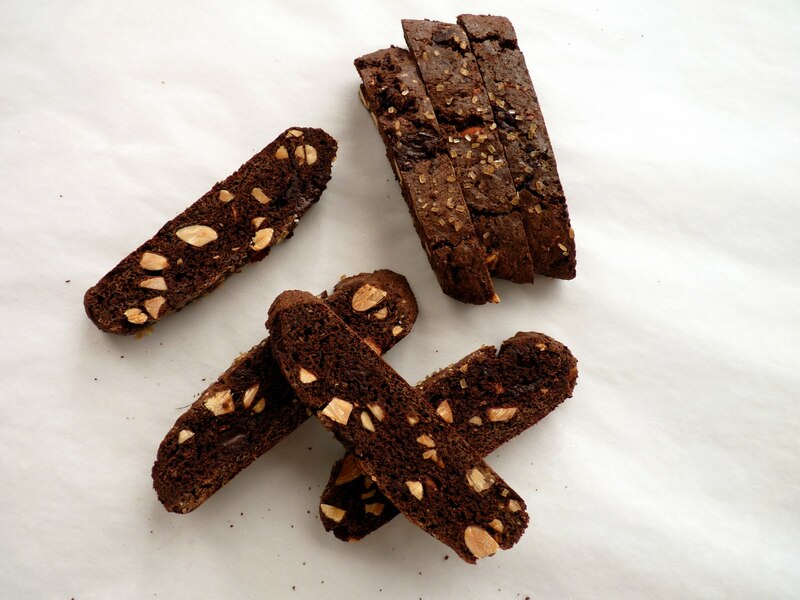 - Biscotti aficionados would also enjoy Classic Biscotti from Chez Panisse and Tish Boyle’s Triple Ginger Pecan Biscotti. Preheat the oven to 350 degrees. Line a baking sheet with parchment paper or silpat. In a separate bowl, beat together the 3 eggs, sugar, vanilla and almond extracts. Gradually stir in the dry ingredients. Add the nuts and chocolate chips until the dough holds together. Divide the dough in half. Place on the prepared baking sheet and form each half into a log about 14” long and about 2” apart from each other. Gently flatten the tops of the logs. Beat the remaining egg and brush it on top of the logs (you won’t use it all). Sprinkle with coarse or raw sugar and bake for about 25 minutes or until the dough feels firm to the touch. Remove from the oven and cool 15 minutes. Place each cooled biscotti log on a cutting board. Using a serrated bread knife, slice 1/2” cookies on a diagonal. Lay the cookies cut side down on baking sheets. Return to the oven for 20 - 30 minutes, rotating the baking sheets halfway though baking, until the cookies feel mostly firm. Cool the cookies completely. Store in an airtight container for up to two weeks. This is a very light and super easy dessert that doesn’t require much forethought or lots of bowls and mixers. And since pears are coming into full blossom, it’s a great way to showcase their gorgeous simplicity. 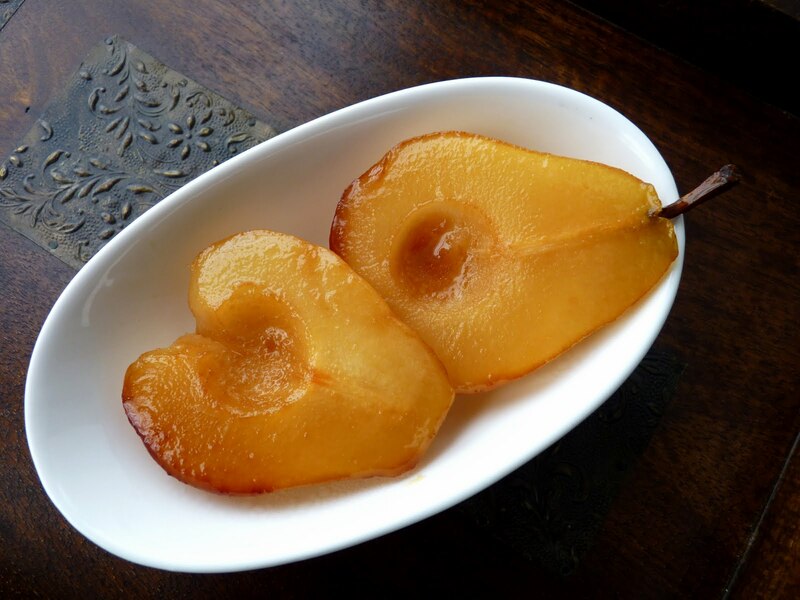 These pears are roasted in a white wine baste sweetened with honey and sugar. 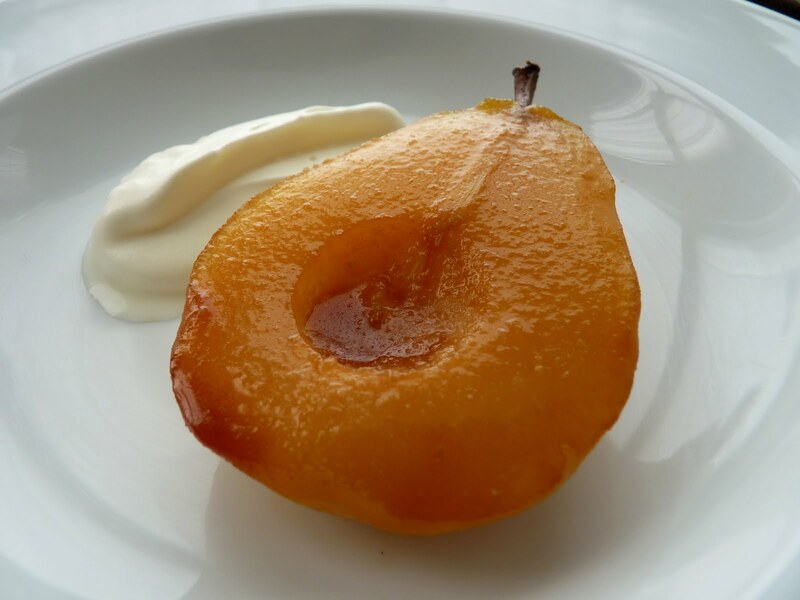 You can serve the pears with a simple dollop of Crème Chantilly (a fancy term for whipped cream sweetened with sugar and flavored with a bit of vanilla), sweetened crème fraiche, vanilla ice cream or a slice of your favorite cheese. Very simple yet extremely satisfying fare. - Choose pears that are ripe but fairly firm. These are Bartletts. - I used Viognier wine but a nice Sauvignon Blanc would be great. - Use a baking dish just big enough for the fruit so that the wine syrup isn’t too shallow, which may cause it to reduce too much. Check the pears every few minutes toward the end of roasting to ensure the liquid hasn’t evaporated at the edges and started to burn. If you notice it’s reducing too much, add a bit of water and keep your eye on it. - For an herbal backnote, add a sprig of thyme or rosemary after the syrup has been reduced and steep for about 15 minutes. Remove the herbs, pour the syrup over the pears and roast. - This will serve 3 whole pears or 6 pear halves or any combination thereof. - Try this with a fresh goat cheese or Humboldt Fog is delicious, as is Alta la tur, Robiola Bosina, Cana de Cabra, bloomy rind Cravanzina, salty blue Valdeon, Roquefort or any creamy blue. Combine the white wine, water, honey and sugar in a saucepan and bring to a boil. Keep at a low boil until reduced by half, about 30 minutes. Peel, halve and core the pears. Arrange them cut side down in a baking dish small enough to just fit the pear halves. 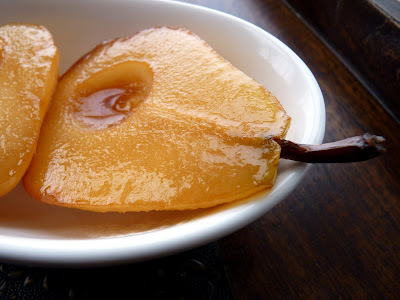 Pour the wine syrup over the pears and roast until tender, about 40 minutes, basting and turning the pears occasionally. Keep a close eye on them the last 15 minutes or so to be sure the syrup isn’t reducing too quickly. Add a splash of water if necessary. Serve warm with desired garnish of whipped cream, vanilla ice cream, crème fraiche or a slice of your favorite cheese. 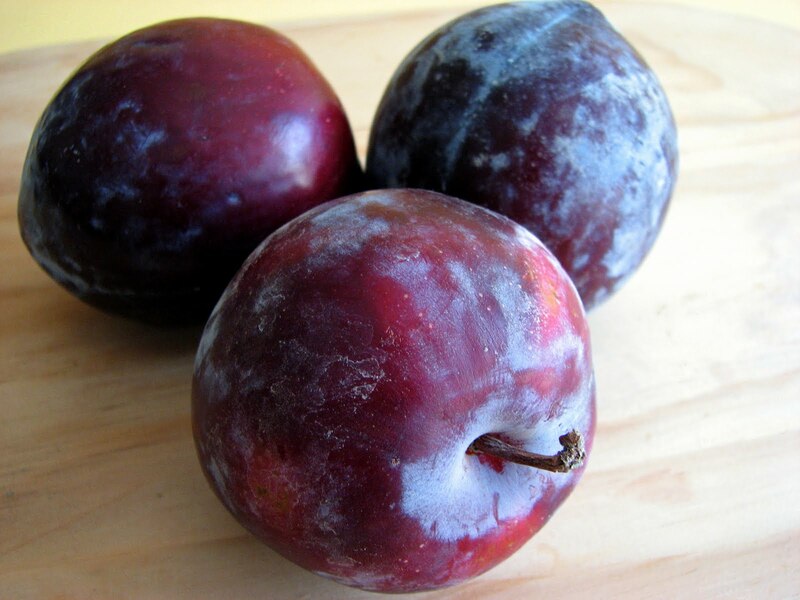 Plums signal the end of stone fruit for the spring and summer seasons. We have definitely arrived at the brink of fall as our thoughts turn to bundling up against the wind and preparing heartier food for our tables. I love plums for their tart juiciness and their bright sensational color. They are wonderful in pies, tarts, galettes, compotes, ice cream and sorbet. They pair well with creams and custards and enjoy a garnish of nuts and spice. For this plum pastry, I start with an almond pastry dough formed into a tart shell and pre-baked. The plums are sliced into chunky bites and combined with a bit of sugar and flour. The tart is then crowned with a simple brown sugar cinnamon streusel loaded with almonds to create a nutty flavor and textural contrast with the fruit. It’s a very simple and straightforward dessert, perfect for this time of year. Time to bundle up with some delicious plums! - Choose ripe plums that are firm to the touch. - You can make the streusel ahead of time and store in an airtight container in your refrigerator. - When rolling dough that has been chilled, let it sit for a few minutes to warm up a bit. As you begin to roll it out, if it’s cracking, it’s still too cold. Wait a couple more minutes and try again. The dough should still be cool but roll out smoothly without resistance. -If you have a bench scraper, now is a good time to use it. As you roll out the dough, use a light smattering of flour as you gently lift the dough after each roll to prevent sticking. If you feel the slightest resistance, use your scraper to gently release the dough and apply more flour. Rotate the dough to ensure evenness. Try to work fairly quickly to avoid warming the butter. When the dough is rolled out to the desired shape and size, use a pastry brush to remove excess flour. - Be careful not to stretch the dough when lining the tart shell. That will cause shrinkage. If the dough cracks or tears while you’re handling it, just use any leftover scraps to press into the crack to patch it up. - If you don’t care to roll out the tart dough, try pressing it into the tart pan right after mixing. Just be sure the dough is evenly distributed and pressed to the same thickness throughout. - Once the tart shell is formed in the tart pan, place it in the refrigerator until thoroughly chilled before baking. - This tart is nice served with a dollop of fresh whipped cream or sweetened crème fraiche. To make the tart dough, place the almonds, confectioner’s sugar, flour and salt in the bowl of a food processor and process until the almonds are finely ground. Add the 1/2” pieces of butter and pulse the ingredients just few times until the mixture looks like coarse meal. Add the egg and the vanilla and process just a few seconds to blend. As soon as the mixture starts to come together in clumps, stop. Do not overmix. Gather the dough and place on a piece of plastic wrap. Form a compact flattened disc, wrap tightly and chill for at least 2 hours. When you’re ready to roll out the dough, remove from the refrigerator and place on a lightly floured piece of parchment paper or work surface. Let it rest for 3 – 4 minutes so it can soften just a bit to prevent cracking. Lightly dust the surface of the dough with flour and roll out to a round shape about 12” in diameter, large enough to line a 9” tart pan with a removable bottom. Keep the work surface and dough lightly floured as needed and gently lift and move the dough after each roll. When you have the desired shape, brush off any excess flour, lift the dough into the pan and shape it to fit closely into all the contours of the pan. Trim any excess. Chill for about 30 minutes. Preheat the oven to 350 degrees. Prick the bottom of the tart shell several times with the tines of a fork. Bake the tart shell for about 18 to 23 minutes or just until it has taken on a bit of color. Check halfway through the baking and prick the bottom once again if needed. Transfer to a rack to cool. For the streusel, combine the flour, sugars, salt and cinnamon. Add the cold butter and work it in with your fingers until all the ingredients are moist. Add the sliced almonds and combine the mixture until there are both small and large crumbles. 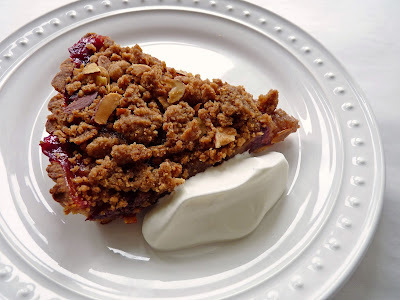 The streusel should be chunky rather than fine to add texture. Refrigerate until ready to use. Cut the plums in half and remove pits. Coarsely chop the plums into bite-sized pieces and place in a bowl. 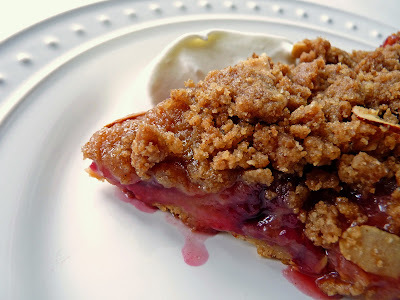 Combine the sugar and flour and toss with the plums to coat evenly. Pour into the pre-baked tart shell and distribute evenly. Sprinkle with streusel. Place the tart on a baking sheet lined with parchment or a silpat. 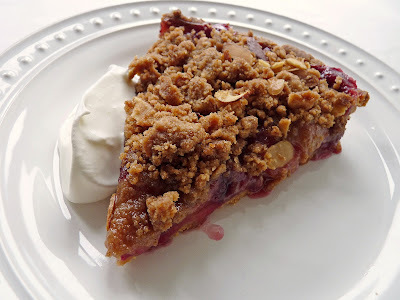 Bake for about 35 minutes or until the fruit is bubbling and the streusel has browned. Remove from the oven and cool completely on a wire rack. If you love the bright spicy heat of ginger, you'll definitely enjoy these biscotti. They are light, full of crunchy texture and deliver on the delicious flavor of ginger in three forms: fresh, ground and crystallized. This recipe comes from Tish Boyle, author of the tremendously fun and delicious cookbooks, The Good Cookie and The Cake Book. Be sure to visit her beautiful blog. 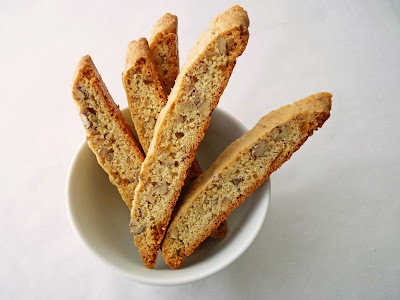 Biscotti are incredibly easy to make. It's just a short mixing of some basic ingredients, shaping the dough into logs and slipping them into the oven. Once they are baked, they are set aside to cool for 10 minutes and the oven temperature gets lowered. The logs are then sliced and go back into the oven for a final toasting and crisping. The aroma of these baking will fill your kitchen with desire. The results are wonderfully fresh biscotti to keep you company at your morning and afternoon refreshments. - The dough is very, very sticky, so lightly flour your hands when shaping the logs. - Next time I make these, I think I'll toast the pecans for a richer nut flavor. - Use a microplaner to grate the fresh ginger. 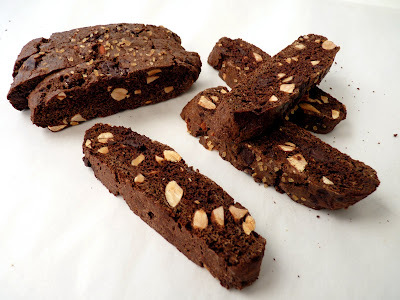 - Biscotti keep quite a long time when stored in an airtight container. 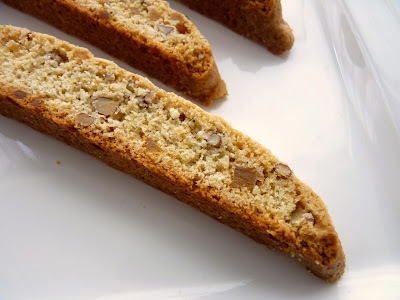 - If you love biscotti, be sure to try Classic Italian Biscotti. Preheat oven to 325 degrees. Line two baking sheets with parchment paper or silpats. Whisk together the flour, baking powder, ground ginger, salt and black pepper. Set aside. Chop the crystallized ginger into small bite-size pieces. Coarsely chop the pecans. Set aside. Beat the butter and sugar together at medium speed until well blended, about 1 minute. Add in the eggs, one at a time, beating well after each addition. Scrape down the bowl. Mix in the grated ginger root and vanilla extract. Add flour mixture at low speed, mixing just until blended. Add the crystallized ginger and pecans and mix until just combined. The dough will be quite sticky. Bake for 35 minutes, switching and rotating the pans about half-way through, until the logs just start to brown lightly. Set the baking sheets on a wire rack and cool for 10 minutes. Reduce the oven temperature to 300 degrees. Gently loosen the baked logs from the parchment paper or silpat and transfer them to a cutting surface. Using a serrated knife, cut the logs on the diagonal into 1/2-inch slices. Arrange them cut side down on parchment or silpat lined baking sheets. Bake an additional 18 - 22 minutes, switching and rotating the pans about half-way through, until the biscotti are dry and just begin to color around the edges. Transfer cookies to wire racks and cool completely.